Moses, the Man of the Mountain, wrote the first five books of the Bible, and is said to have written many more, among them the magical gimoire, "The Sword of Moses," and the well-known "Sixth and Seventh Books of Moses." In addition, he is the subject of one of hoodoo's finest grimoires and spell=books, "The Mystery of the Long-Lost 8th, 9th, and 10th Books of Moses" by Henri Gamache. As "The Giver of the Law" and "The Leader of His People," he is called upon to enforce the Ten Commandments and to give practitioners the strength to carry on against impossible odds in the fight for civil rights and social equality. 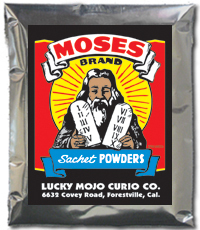 Moses Sachet Powder is often dusted on papers, including court supoenas, restraining orders, bills of divocement, real estate deeds, and other such items, to bring the strength of will and divine guidance to the works they represent.